The Hogue EX-A03 Auto is an Allen Elishewitz designed knife that features a single-piece PPS polymer frame with molded/nested steel bolster plates. The handle has a raised grip patch on front, jimping up top, and a light texture elsewhere. There is a skull crusher at the base of the handle and a reversible tip-up/down carry pocket clip. Push button lock and the sliding safety. The black finished 154-CM steel blade has confidence inspiring action and lockup. 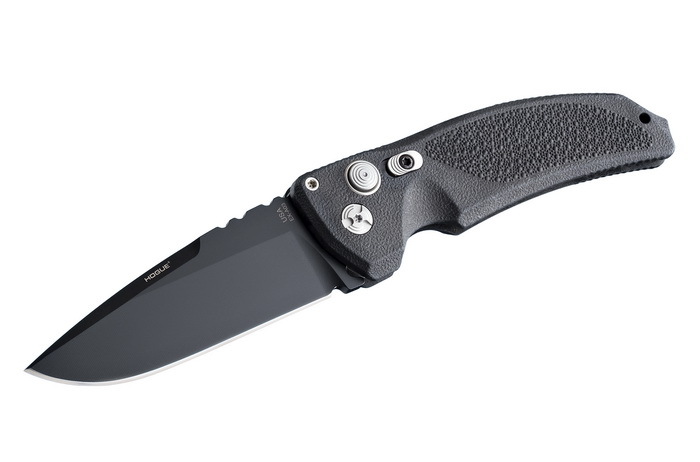 This EXA03 automatic knife has a 3.5" Black Ceracote coated Drop Point blade and Black polymer handle.